I love pineapple eaten fresh or in fried rice or in curries. I bought one the other day and being lazy to cook anything elaborate, I went for something easy and fried rice is such a versatile one dish meal. You throw in anything you want and yet it will turn out delicious. And lately we have changed to eating brown rice and I was curious to know how brown rice will taste like when fried with other ingredients. 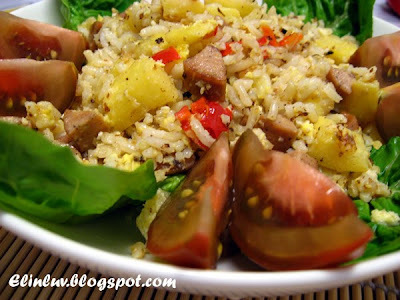 I fried it with pineapples cubes and it was good for a simple meal :)) the tangy pineapple adds flavor to the fried rice Mmmmm simple to prepare and good for people who are laazzzy busy to cook or for those who have no time to cook becoz they have to blog ! LOL! enjoy every burst of flavor in each and every mouthful..mmmm yummy! Heat up olive oil in a wok and saute garlic till fragrant. 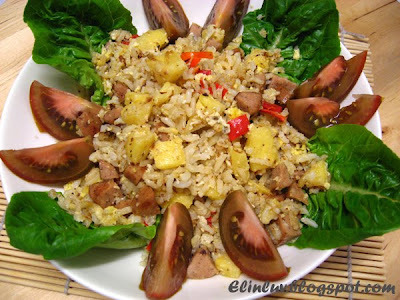 Add in the diced sausages and pineapple cubes and stir fry for 3 minutes, add in the cooked brown rice and fry it till well mixed with the pineapples and sausages. 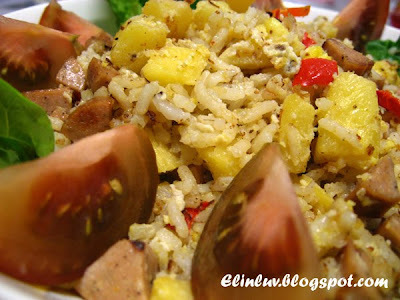 Push aside the rice mixture, add in the eggs in the center of the wok and fry till eggs are half cooked, push back the rice to cover the eggs and continue to stir fry the rice till every ingredients are well mixed with the rice. Add cajun and paprika and sea salt to taste. Dish up on a plate decorated with lettuce and kumato slices. Serve hot. Enjoy a hearty and simple rice dish! first will it be a feast "
my fren gave me a pineapple yesterday, i didnt know what to do with it and put some pieces into my apple tongsui... the rest were eaten raw.. if only u posted this earlier, then i would have done some fried rice with pineapple.. must be very yummy leh... LOL !!!! I'm supposed to do this too with Thai flavors but I realized I don't have any brown rice. :) This looks great. Hahaha, I can see you've bought a lot of kumato tomatoes recently. I like that! "No time to cook because they have to blog"Lol! 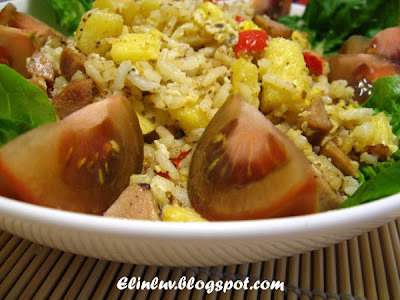 With brown rice, very healthy version of fried rice!! How does it taste with brown rice? 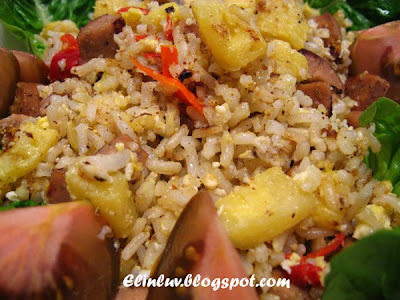 Love pineapple fried rice, each time I eat in 1919, I'll order that dish. Nice, tantalising one dish meal. I think the texture of brown rice goes well w/pineapple. Yum! I love the brown rice texture. Very aromatic when chewing. It tastes even better wth pineapple.